In the safe spaces of our classrooms we regularly use books as provocation for deeper understandings about differences in appearance, cultural and religious beliefs, gender identity, learning, thinking and being. By acknowledging and celebrating our differences, we intend to find connections in our humanity and to develop empathy that will lead to a better life for all. As we curate anti-bias book lists for our classrooms, we carefully consider topics that are relevant to our students, that include characters and places that are either mirrors of themselves or windows into learning about others. Our Progressive pedagogy is palpable during the read-alouds as the children’s ideas and questions shape classroom discussions that have the power to transform the ways that we behave outside of the classroom. A way in which all people are treated with respect, openness, and trust. The Other Side by Jacqueline Woodson is a picture book about two girls, one African-American and the other white, who are separated by a fence. Among our primary grade children, this story has become an essential text that speaks to friendship, inequity and racial prejudice. Upon an initial reading of the story, children typically assume that the setting is during the time of segregation. However, when told how Jacqueline Woodson intended the story for the present, a child-led conversation ensued about how inequity still exists and what we might do to change that. During one of the conversations of The Other Side, the children discussed how they could would like to replace the fence with something that would bring the girls together. This led to beautiful watercolor paintings of a doorway, arches, swing sets and a treehouse, their symbols of peace and friendship. Fueled by recent staff work focused on gender identity, the Kindergarten, first, and second grades engaged in a read aloud about Red: A Crayon’s Story (M. Hall). This book invites readers to consider how someone might be incorrectly “labeled.” Invited to share their thinking, children interrupted throughout the story, wondering why Red, (who identified as Blue) was pressured to try to be something it was not [Red], feeling sad for Red’s marginalization among the other crayons, and making real world connections to the transgender community. One of the children empathized with Red and shared how she has a friend “born with a boy’s body parts but in her heart and brain is a girl.” While some children accepted this insight as any other contribution, others had more questions. As a follow up to Red, the same groups engaged in a read aloud of I Am Jazz by Jessica Herthel and Jazz Jennings, based on the true story about Jazz Jennings, an activist and spokesperson for transkids. This led to a clearer understanding of the experience of their classmate’s friend. Also during this read aloud, one of the children astutely connected I Am Jazz to Morris Micklewhite and the Tangerine Dress (C. Baldacchino), recognizing the common themes of gender nonconformity and empathy. These conversations encourage our children to freely explore in the dress up area, to confidently act in theatrical roles across genders, and to respect the gender fluidity of our community members. We know that children learn best when they talk. 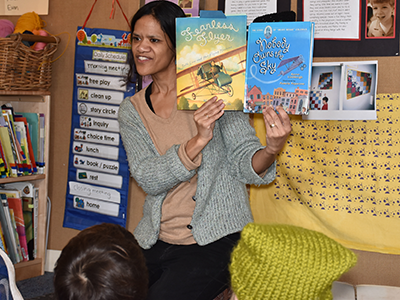 With books as provocation and within the safe spaces of our classrooms, children can wrestle with ideas, ask questions, learn about different perspectives and develop the empathy and hope necessary in a world with so much turmoil. The seeds of change are within all of us, especially in the young minds and hearts of our children.